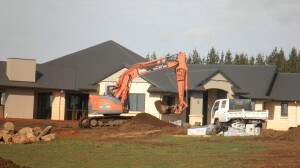 Onsite Development Solutions is an experienced, family owned Earthworks and Laser Levelling company offering a wealth of experience and knowledge. Whether you require residential or rural earthworks, rural drainage, commercial laser levelling or equestrian arena construction, Onsite Development Solutions has the equipment and team of dedicated professionals to ensure that each project is finished on time to your specifications. As always, Roger is ready to discuss your project and happy to come and visit your site. Phone Roger on 0274-870-955 for a no obligation quote. The latest in technology, experience and professional team members are the key elements that Onsite Development bring to your project. We provide you with the service and finish that you expect and deserve. By keeping up with the latest technology Onsite Development Solutions is able to offer you precision combined with the benefit of years of experience and reliability. Not how we do it in NZ!